Going to a restaurant is not just about sampling a new cuisine. Architecture, like food, has a way of making us feel a sense of time and place. The ambience and decor of the restaurant also contribute to the overall experience of dining there. Let’s take a look at some gorgeous restaurants in India that offer something beyond just great food! Here’s a list of 10 interesting restaurants with interiors as delicious as the delicacies they serve. Located right behind the Taj Hotel in Colaba, The Table is one of the most stylish and unique restaurants located in South Mumbai. Inspired by global cuisines, The Table serves a San Francisco styled menu that changes every day. What immediately captures the attention are the ceiling-to-floor windows and the 20 foot long Burma Teak Community Table. The flooring is dominated by zigzag black and white patterns, with the ground floor mainly reserved for drinking. The upper floor is more suited for a quite fine-dine experience. Blending Indian and Italian Hospitality together perfectly, Bar Palladio is elegance redefined. Devised by the Dutch designer Marie-Anne Oudejans, the place exudes a Venetian charm and takes us back to the Mughal Era. The entire place is coloured an electric blue and took Marie-Anne eight months to bring to life. Beautiful flowery ottomans and big chandeliers lend an unparalleled aesthetic appeal to this masterpiece of a Restaurant. Nestled amidst lush greenery, the outdoor seating area comprises of white and blue canopies. You can spot lovely peacocks from this vantage point while enjoying the sweet aroma of mango trees planted alongside. Bar Palladio is the place to go when in the pink city and feel utterly blissful with its royal appeal. Located in the posh area of Carter Road in Bandra, Masala Bar is the go-to place for enjoying the exciting nightlife of Mumbai. The window panes are studded with magnifying glasses and provide a panoramic view of the Arabian Sea. 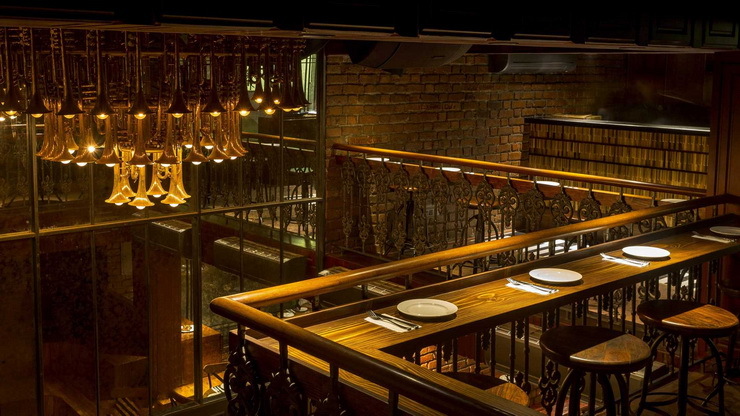 Owned by Zorawar Kalra, this restaurant will grab your eyeballs with its gorgeous interiors. The USP of this place are the beautiful candles lit to exude a natural warm glow instead of the usual light bulbs. Mirrored walls and ceilings make this as one of the most enigmatic places to dine at. Who said you can curl up only with a cup of coffee whilst reading a book? Library Bar redefines the notion beautifully with its plush interiors and an array of options available in some high-end liquor. Located on the luxurious property of The Leela Palace, the bar appears to be something straight out of a picture book! Regular visitors vouch for the best collection of wine available in the city. Dark wooden furniture and leather sofas dominate the space. Dimmed lights, big chandeliers and the interiors remind you of colonial times. The Library Bar raises the ‘bar’ for people who like to indulge in luxury while sipping on a select malt of Whiskey. You will not be able to stop yourself from quoting the famous tagline from the advertisements of Brooke Bond Taj Mahal Tea back in the 90’s, as soon as you step into this gorgeous cafe. Located at Bandra in Mumbai, this place exudes vintage vibes. The brothers Ayaz Basrai and Sameer Basrai have succeeded in preserving the old world charm of the beautiful suburb of Bandra with their superb sense of Interior Design. Full of colonial style furniture, rocking chairs, spacious rooms and the lovely Hindustani classical music, the Brooke Bond Taj Mahal Teahouse is a must visit for people who want to be transported to another era. For those who want to soak up some morning sun along with a good read and some Irani mint tea, the sunlit patio welcomes you. One of the finest and most picturesque restaurants in Delhi, Lodi Garden is where you will find all the foreigners and expats flocking for some peaceful lunches. The design of the restaurant is inspired by nature evident in its lush botanical surrounding. The place is perfect for a romantic setting, with their private canopies. Beautiful pebbled walkways and cane and wooden furniture give the place an earthy vibe. Hues of orange and red complement the decor. To give a twist to the lovely décor, a herb cart is placed within the gardens, letting the visitors know about the various herbs used which are grown in-house. Situated on the 37th floor of St.Regis, Yuuka is a little piece of Japan in the heart of Mumbai. It gives a picturesque view of the Bay’s towering skyscrapers and the hustle and bustle of swanky Lower Parel. Yuuka exudes Japanese charm through its chic interiors. High ceilings, dark tables and comfortable beige chairs coupled with black and gold cutlery speak volumes about the clarity with which the restaurant was planned. Origami which is inherent to Japanese culture is displayed elegantly by blending dark wood with gold. Aer Lounge is located on the 34th Floor of The Four Seasons Hotel in Mumbai. It gives one of the most breathtaking views of the maximum city. The Lounge entrance offers a surreal experience, covered entirely with mirrors and glasses. Once inside, the classy posh vibes engulf you with its minimalistic and illuminated furniture. Every table feels alive with the warm glow of radiant lights. It is one of the elite rooftop restaurants of Mumbai where you can spot the who’s who of the city. This club looks like it has come right out of a street in New Orleans. The interiors are done in dark wood and the club spans to the ground floor and mezzanine level. You can enjoy live gigs here against the long mirrored wall and a Chandelier that is made up of 58 trumpets. Red brick walls are inscribed with the names of Jazz legends and the main attraction is the Bar which is made out of hand-cut wooden chips. The place is simply a jazz lover’s paradise with all things jazz and gives out a very rustic, edgy feel. Megu, a Japanese restaurant located on the premises of The Leela Hotel is breathtakingly beautiful. The design of the hotel balances the modern and the ancient with its fabulous interiors. The crystal statue of Buddha sitting in a pool of water gives the whole place a Zen like feel. You cannot miss the towering bell placed right over the statue and feel engulfed in tranquillity. The floor is an all black granite that adds to the grandeur. Aren’t they all just divine? Speak to one of our experts today if you wish to own a gorgeous restaurant of your own! Newer PostUp Your Home’s Resale Value By Upping Your Interiors! Older PostA Nature Lover’s Guide To The Serene Interiors Of A Concrete Jungle!